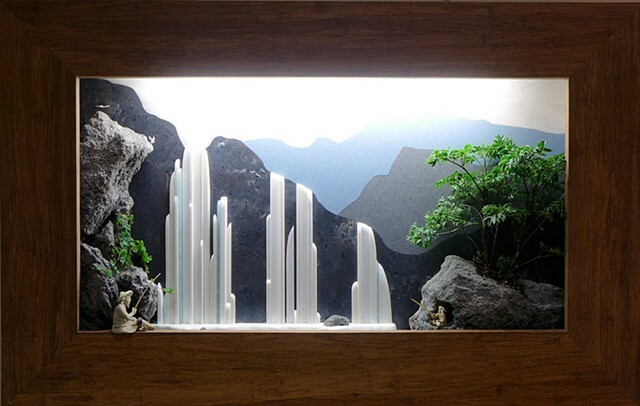 36" x 23" x 4"
This shadowbox composition uses Corian fragments in a 3-D interpretation of painting techniques employed by traditional and modern Chinese artists to depict panoramas of real and imaginary settings. In addition, rough-hewn stone, miniature figurines, and live plants create a dramatic foreground, leading the eye into the traditional composition of waterfalls and slopes in the far distance. A frame of unfinished strand bamboo surrounds the composition. A recessed fluorescent grow lamp accentuates the surface textures and facilitates plant growth, allowing this composition to be located on any wall, irrespective of available sunlight. * Lee. S. E. (2003 ). A History of Far Eastern Art, 5th Edition. Prentice-Hall. p. 302. ** Sullivan, M. (1996). Art and Artists of Twentieth-Century China. University of California Press. p. 24.